Renal cell carcinoma (RCC) is a common malignancy that is often detected incidentally in patients undergoing cross-sectional imaging of the abdomen for workup of pain or other symptoms. Due to overlap in imaging findings of RCC and benign tumors, biopsy may be necessary to confirm the diagnosis. Biopsies are occasionally non-diagnostic, however, and in small lesions or patients with comorbidities may not be technically feasible. 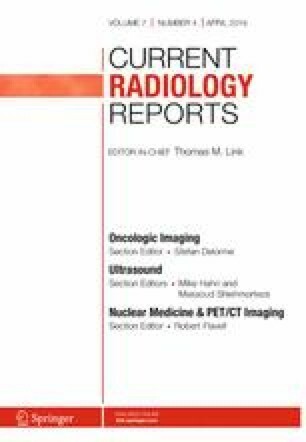 Molecular imaging techniques can characterize tumors as being more likely malignant or benign and obviate the need for invasive testing, as well as providing accurate whole-body staging in patients with known RCC. PET/CT with 18F-FDG and other radionuclides can identify primary renal masses with higher malignant potential and also allows for sensitive detection of metastatic RCC. SPECT/CT imaging with 99mTc-sestamibi can provide useful information to support the diagnosis of benign oncocytic neoplasms over more aggressive RCC subtypes. Investigational molecular imaging techniques such as immunoPET and hyperpolarized 13C MRI have also shown promise in renal mass characterization. This review article aims to outline the various molecular imaging modalities available in the evaluation of primary renal tumors and in whole-body staging of metastatic RCC. The authors acknowledge Dr. Steven Rowe for contributing the cases as shown in Fig. 4. Spencer C. Behr reports grants from Cancer Targeted Technology and GE Healthcare and is a consultant for QED Therapeutics. Robert R. Flavell is a section editor for Current Radiology Reports. C. Elias Graybiel and Zhen J. Wang each declare no potential conflicts of interest. • Shinagare AB, Krajewski KM, Braschi-Amirfarzan M, Ramaiya NH. Advanced renal cell carcinoma: role of the radiologist in the era of precision medicine. Radiology. 2017;284(2):333–51. https://doi.org/10.1148/radiol.2017160343. Provides an overview of the pathophysiology of the various RCC subtypes, imaging features, and current therapies employed for treating advanced RCC. • Campbell S, Uzzo RG, Allaf ME, Bass EB, Cadeddu JA, Chang A, et al. Renal mass and localized renal cancer: AUA guideline. J Urol. 2017;198(3):520–9. https://doi.org/10.1016/j.juro.2017.04.100. Provides an update on the American Urological Association guidelines for management of renal masses and localized RCC. • Liu Y. The place of FDG PET/CT in renal cell carcinoma: value and limitations. Front Oncol. 2016;6(201):1–7. https://doi.org/10.3389/fonc.2016.00201. Provides a review of the utility of FDG PET in evaluating primary RCC, in addition to RCC staging and restaging. Behr SC, Aggarwal R, VanBrocklin HF, Flavell RR, Gao K, Small EJ, et al. First-in-human phase I study of CTT1057, a novel 18F labeled imaging agent with phosphoramidate core targeting prostate specific membrane antigen in prostate cancer. J Nucl Med. 2018. https://doi.org/10.2967/jnumed.118.220715. [Epub ahead of print]. • Gorin MA, Rowe SP, Baras AS, Solnes LB, Ball MW, Pierorazio PM, et al. Prospective evaluation of 99mTc-sestamibi SPECT/CT for the diagnosis of renal oncocytomas and hybrid oncocytic/chromophobe tumors. Eur Urol. 2016;69(3):413–6. https://doi.org/10.1016/j.eururo.2015.08.056. provides the basis for 99m Tc-sestamibi SPECT/CT in differentiating benign renal tumors and indolent RCC from ccRCC.